Maurice Jones-Drew has been slowed by a hamstring injury and the Jaguars will wait until Sunday morning to determine if he can play against the Titans. 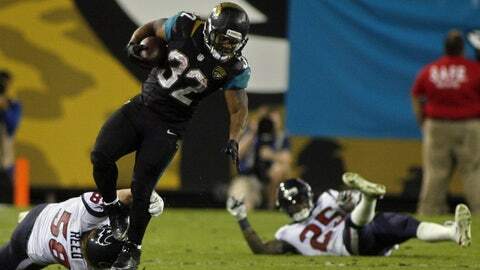 JACKSONVILLE, Fla. (AP) — Jacksonville Jaguars running back Maurice Jones-Drew practiced in a limited capacity Friday, a positive sign he might be able to play against the Tennessee Titans. Coach Gus Bradley says Jones-Drew will be a game-day decision. MJD will work out Sunday morning before the team determines whether he can play in the home finale. Jones-Drew missed last week’s game against Buffalo with a lingering hamstring injury. Jones-Drew is listed as questionable. Linebacker Geno Hayes (knee) and defensive tackle Roy Miller (shoulder) also are questionable. Safety Johnathan Cyprien (thigh), who missed last week’s game, is probable. Also Friday, the Jaguars made several roster moves. Receiver Jeremy Ebert (ankle) was placed on injured reserve. The team signed defensive tackle Jordan Miller and receiver Lamaar Thomas. Both players had been on the practice squad.